In that one paragraph, Whitaker states the whole premise of this wonderment of a book. 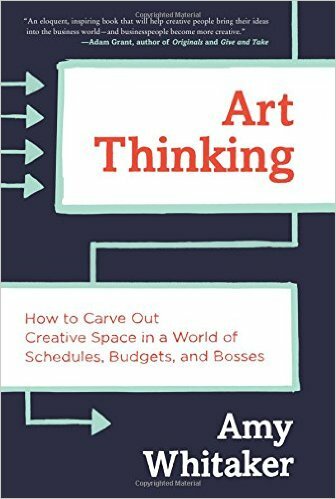 She tells you upfront that what she calls “Art Thinking” is a process of operation rather than an object. The hell of it all is this: in order to get all the way to that point B you’re aiming for, you have to get comfortable standing in that most uncomfortable space of all – the space of not knowing where you are going and knowing even less about how you’re going to get there. Ancient Taoists call this stance “standing in ambiguity.” They didn’t particularly like it either, but they did get good at doing it. Whitaker points out that the whole point of Business-with-the-capital-B is putting prices on things and knowing their “value” ahead of time. However, if you’re in the middle of inventing that all-important point B, there is no way you will be able to even begin to predict what this thing you are building can be priced at and whether it can be “scaled” or expanded or whatever the latest buzz-word is for making the thing huge. She points out that the core assumptions of economics – efficiency, productivity, and knowable value – work best when the organization is already at cruising altitude. When the point B is already defined and it’s sitting there looking back at you, you can do all the economic voodoo mumbo-jumbo to it and work it so that the world beats a path to your door. All that stuff won’t help you launch your new thing when your plane is just four wheels and a lawn-mower engine strewn all over the ground. The problem, of course, is that as Henry Ford once said, “You can’t build a reputation on what you’re going to do.” It just does not work that way. What Whitaker attempts to do with this book is to give you mindsets and strategies for moving your new and wondrous marvel down the road to point B where there’s a catapult all set up and ready to launch it whenever it gets there. She gives you all kinds of ways of moving that can help you pull your baby New Thing out of the Dreamtime so it can toddle around charming the heck out of everybody and maybe make you a pile of lucre or whatever. Whitaker also tells you that the process for getting from A to B can be iterated over and over again, even when the business is up and running or maybe taking off into the stratosphere. Once that happens, the point at which the New Thing that you birthed into the world and are getting scaled up to all kinds of heights then becomes your new point A. If you like (and sometimes even if you don’t) you get to repeat the whole process again, sending out yet another expedition through the ambiguous Not-Knowing place towards your next point B. In this book, Whitaker gives lessons and tips for wanna-be wizards bent on manifesting and refining their dreams while they continue to build the world-as-they-want-to-know-it. She does it very well. There are seven art mindsets that Whitney explains. For each one she plunks you down into a particular way of seeing and gives you stories and insights about how to make the thing work in the business world. The titles for her chapters are like an inventory list of the tool-belt she’s handing you. Her explanations of them are mind-expanding. To See the Whole…where you navigate the complexity of organizations and disciplines to tackle the Big Questions of the day. I do highly recommend this as a book for your resource shelf. It is one you’ll keep coming back to when you need to change the channels in your head and it’ll definitely get you thinking new thoughts about the way you are moving. From a million little poke-holes.